Media reports indicate the Trump Administration could declare war on clean cars as soon as this week by freezing existing federal fuel economy standards and eliminating California’s ability to set its own tailpipe emissions standards (which 13 other states plus Washington, D.C. have adopted). These moves would constitute grievous harm to the environment, public health, and the U.S. economy – but how much? New modeling by Energy Innovation, using our Energy Policy Simulator, predicts the effects of a clean car rollback. Our research predicts that freezing these standards would cost the U.S. economy more than $450 billion in costs through 2050. 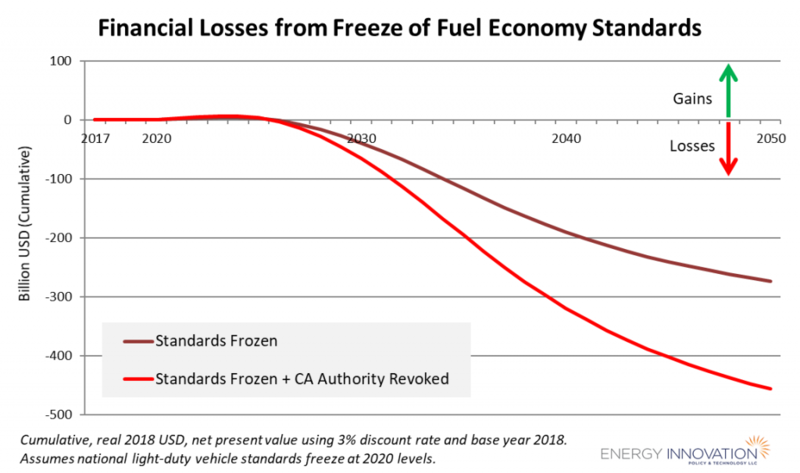 The model shows that in the first few years after freezing fuel economy standards, the rollback would create small financial gains, because it is less expensive to build cheaper, less efficient cars. However, these gains are quickly swamped by increased fuel expenses that grow each year, as more and more years of fuel savings are relinquished, reaching a cumulative $457 billion by 2050 (in real 2018 U.S. dollars, discounted at three percent annually). California has vowed to fight any rollback in court, and if it prevails, the fuel economy freeze would only affect 65 percent of the market, lowering the costs of the proposal to $274 billion. Rolling back fuel economy standards would also increase transportation sector greenhouse gas emissions, worsening global warming. 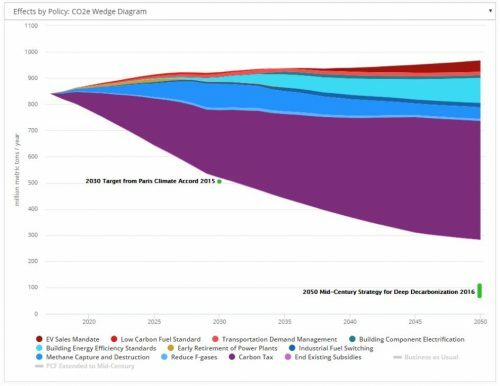 The greatest emissions increases occur in the 2030s, because the growing market share of electric vehicles (EVs) reduces the importance of gasoline-powered vehicles’ fuel economy in the 2040s relative to the 2030s. In 2035, under current policy, transportation sector emissions are projected to be 1,293 million metric tons (MMT) of carbon dioxide equivalent (CO2e). 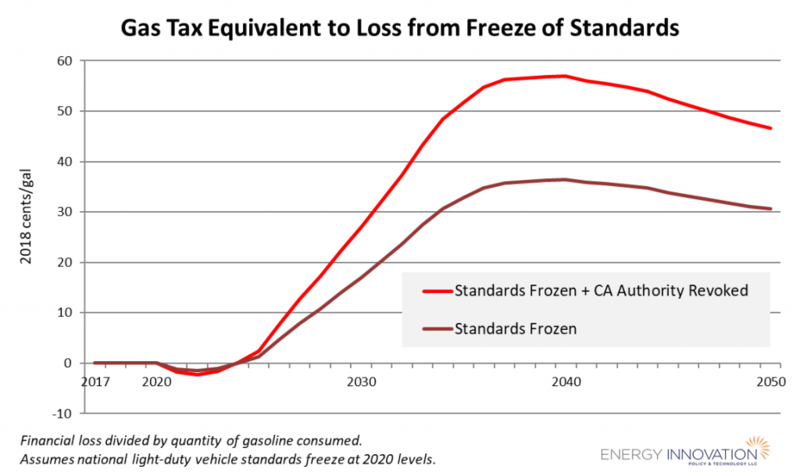 With the fuel economy standards frozen, that year’s emissions would total 1,432 MMT, an 11 percent increase. 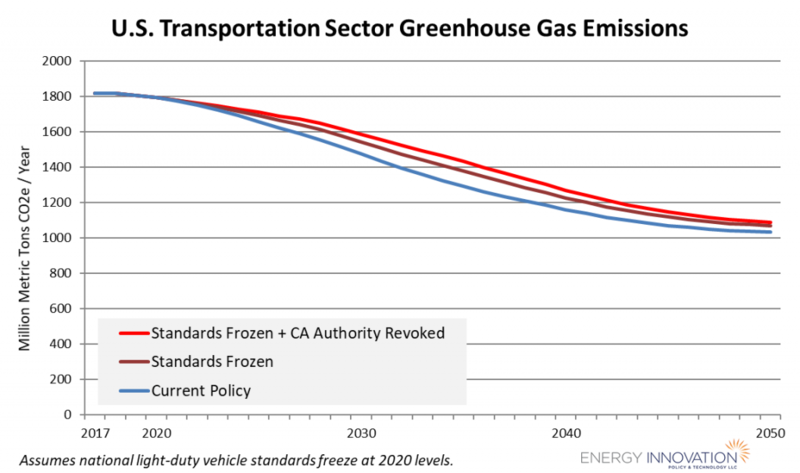 Without revoking California’s authority, 2035 emissions would total 1,378 MMT, an increase of 7 percent. Freezing federal fuel economy standards will harm U.S. consumers, who will pay more money to drive their cars the same distance, and who will suffer from additional death and disease caused by pollution. It will harm businesses that rely on light-duty vehicles, such as taxi, food delivery, and ride-sharing services. It will worsen global warming and reduce U.S. energy security. It may lead to a court battle with California and fragment the U.S. automobile market, increasing costs to automakers. It will reduce the competitiveness of U.S. automakers, who oppose freezing the standards. The only winners are the oil companies, who stand to sell more gasoline.